For a duration of no less than 5 months! Remember that while the collar does kill the ticks, it’s still a good idea to check your dog for ticks daily, removing them wherever they’re found. Make sure to remove the collar while bathing the dog as consistent swimming or bathing can diminish the collar’s effectiveness. can it be used for big dogs? what is the dosage like? Kiltix comes in one size fits all dogs. This product fits and works on your dog regardless of its size. Yes it can be use with Bravecto. Hello I need 2 collars for small dogs (up to 11 kg) And 2 collars for big ones. Please help me to make a resarvation. Thanks Nurit. Hi! Certainly we can help you find collars. You can find the products you need at the following link: <a href="http://goo.gl/UvWxru">http://goo.gl/UvWxru</a> You can place an order online or by phone toll free at 855 908 4010 Thanks for your inquiry! Can this product be used together with Advocate? I use advocate to protect my dog from spirocerca lupi. Great Service! Good Prices! Fast Ship especially for International. 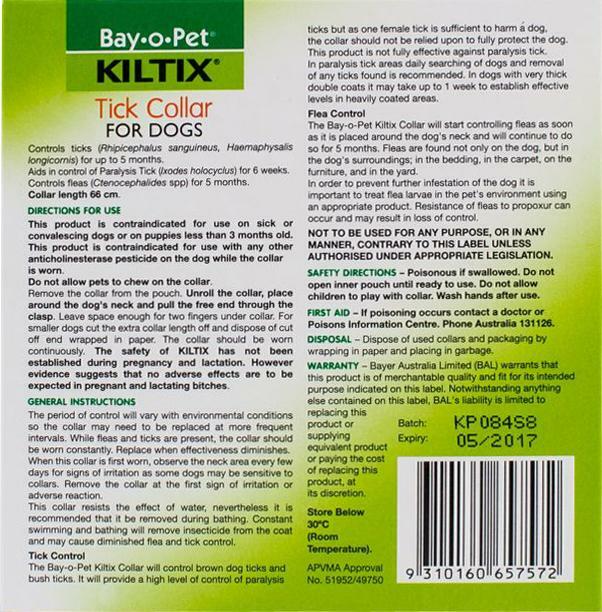 The Kiltix Tick Collars have been AMAZING FOR OUR DOGS! Especially ours in a yard by acres wooded land and no houses. Every year products I always use with success for fleas, heartworms etc. never tackled the ticks successfully. Especially dogs in our back yard exposed to many more because of wildlife. These collars really work amazingly and longer than one month to boot! 1st time ever a Border Collie of ours wasn’t covered with ticks despite treating our yard, using Frontline Spray, even dips. 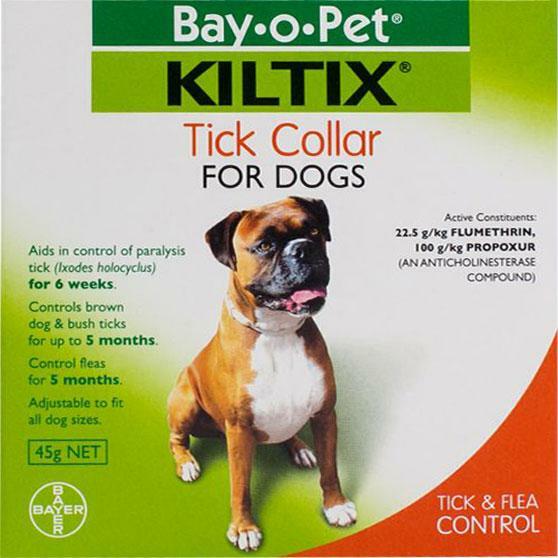 I hadn’t tried a flea or tick collar for dogs since I was a kid Many years ago! When that was all they had other than dip and they were about worthless! But the price was right so I tried them. I was Amazed how well they work and how long! We and the dogs are Happy! With multiple dogs Frontline Spray has always been the most cost effective product I can depend on to work. My only disappointment is that Pet Bucket doesn’t carry it and I HAVE to go elsewhere to purchase it. But the collars, heartworm meds and Revolution or Stronghold for our 10cats I really save money here! We have several acres and a smaller "cat yard" inside a larger fenced yard with many acres all around. The "cat yard" has worked for our cats to go in & out a cat door we have to the back of our house. Why? Because "Sammy" our Border Collie thinks HIS JOB is to keep those cats corralled to THEIR YARD! ANY Wannabe escapees are quickly herded back to the safety of the smaller cat yard! The few who tried soon got disgusted and just look at him with disgust now. Any Border Collie Owners KNOW how much a Border Collie NEEDS a job or he will MAKE one not always good! Here is a pic of Midnight one of our cats who never messed with trying to go farther! She's a rescue as all our pets are. This pic looks good for Halloween because she's a Black Cat and it looks like she is Mesmerised by a lit Candle. OKIE owner of a small Ponderosa home to many strays that found us!